The decision to purchase the property where the Holy Church of “St. 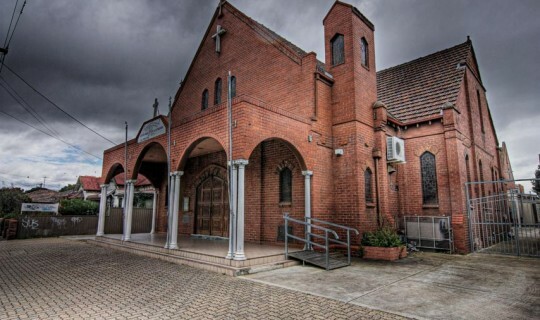 Eleftherios” was to be housed was made at the Board meeting of the Greek Orthodox Community of Melbourne and Victoria (GOCMV) dated 22nd of October 1968. The purchased property was a church that belonged to the Methodist Church and located on Albion St, West Brunswick. According to the minutes of the GOCMV meeting the then President Mr. D. Elefantis noted that “we have an opportunity to purchase both a church and a hall in the suburb of Brunswick for the price of $30,000 with a deposit of $8000.” The Board decided unanimously to purchase the properties. “We hereby bring to the attention of all Greek residents of West Brunswick and surrounding suburbs that the first service to be held at the Holy Church will take place on the 27th April 1969 in the recently purchased by the GOCMV Methodist Church that is located at 279 Albion St West Brunswick within close proximity to the West Brunswick train station and the No. 30 Sydney Rd. tram route, at the same address where the GOCMV afternoon school operates. As of the aforementioned date the Holy Church of ‘St. Eleftherios’ will conduct services normally, every Sunday and all other Feast Days. The GOCMV has appointed as the church’s priest, Father Dimitrios Zivas who will be available to all parishioners during weekdays between the hours of 4pm – 7pm. Further enquiries can also be made during weekends.